For a weary traveler in search of a cab, or those who have suffered a car breakdown, the isolated country phone box is a sight for sore feet. Shining like a bright red beacon of civilization, these bastions to communication are littered across the English landscape, ready to provide contact with loved ones, the AA or a pizza delivery. 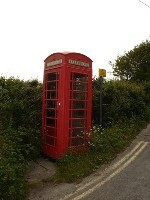 Barrow Hill's lonesome phonebox was inspired by a historical red box near Tredinnick, in Cornwall. Re-building the box in 3d was a fun process, and offered a little in the way of education. Middle: The phone box built for Barrow Hill. 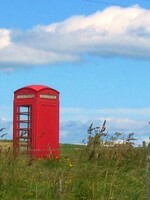 Right: A lonely phone box on the moorsl. 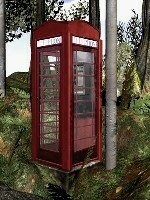 Over the passing decades, the traditional red phone box has undergone many re-designs and revamps. The version below is a K6, Jubilee Model. Designed by Sir Giles Gilbert Scott to commemorate the Silver Jubilee of King George V in 1935, the K6 soon became the most famous and best loved of all of Britain's telephone boxes. The 'real' phone box, shown left, is a bit battered and neglected, but the glass panes remain unbroken,a nd the phone line is clear, crisp and ready for emergencies, both large and small.